During December 2011, a salvage excavation was conducted along the northern fringes of Horbat Biz‘a (Permit No. A-6334; map ref. 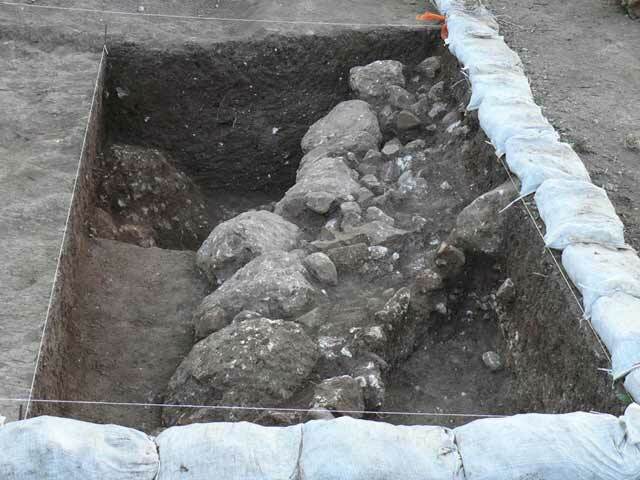 202016–108/705457–87), after ancient remains were damaged while widening Highway 581 and Kalaniyot Junction. The excavation, undertaken on behalf of the Israel Antiquities Authority and underwritten by the Shikun Ve’Binui–Solel Bone Infrastructures Company, Ltd.,was directed by A. Massarwa (field photography), with the assistance of L. Pri Gal (area supervision), Y. Amrani (administration), M. Kahan (surveying and drafting), A. Gorzalczany (guidance), P. Gendelman and R. Toueg (ceramics), M. Shuiskaya (pottery drawing), and D. Kirzner and K. Sa‘id. Horbat Biz‘a extends across a small tell southwest of Qibbuz Ma‘anit (Fig. 1) and is part of a series of small sites located along the juncture line of the Samaria foothills and the Sharon plain, which were inhabited during the Roman, Byzantine, Early Islamic, Crusader and Ottoman periods; noted among the sites are Horbat Burin (North), Mezer, Tel Narbata and Khirbat Nazur. 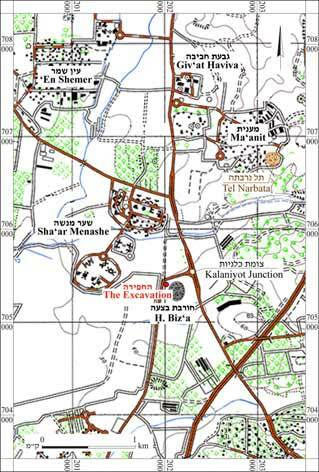 Horbat Biz‘a was documented on the Survey of Western Palestine map as Kh. Kafr Basa. Architectural remains and winepresses were documented at the site in the Map of Ma‘anit survey and fragments of pottery vessels from the Chalcolithic until the Ottoman periods and crystallized glass were collected (Map of Ma‘anit , Site 33). Remains of an industrial region, dating to the Roman and Byzantine periods and possibly also to the beginning of the Early Islamic period, were exposed in an excavation conducted at the site in 2000 (HA-ESI 118). 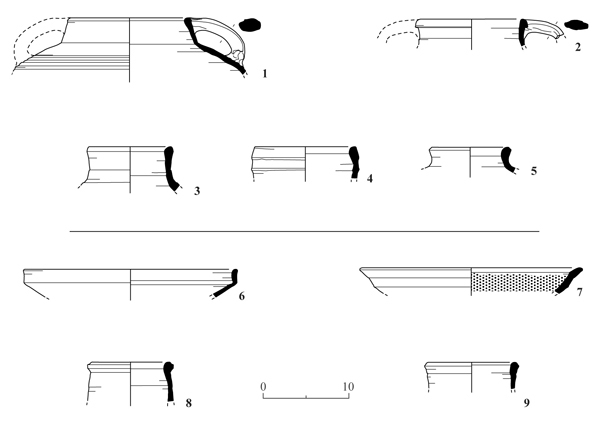 Nine excavation squares (D1–8, D10; Fig. 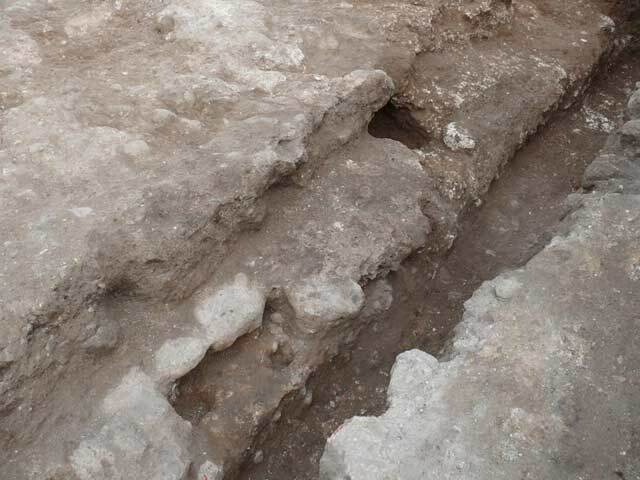 2) were opened in a row, aligned southeast-northwest, and remains of floors and a water channel from the Byzantine period were exposed, as well as architectural remains ascribed to two settlement phases (II, I) in the Early Islamic period. The excavation area was severely damaged due to the road-widening work. Remains of two floors (L412, L413) were exposed in Squares D1 and D2; the floors consisted of crushed chalk and small stones (thickness 0.1 m) and continued beyond the limits of the excavation squares. The two floors were placed on a tamped bedding of gray mortar mixed with shells (thickness 0.4 m). Body fragments of pottery vessels dating to the Byzantine period were discovered below the floors. The floor beddings were set on the sides of a water channel (L415; exposed length 8.1 m, width 0.35 m, depth 0.1 m; Fig. 3), hewn in the bedrock and sloping slightly to the southeast; it continued beyond the limits of the excavation area. Soil fill, several body fragments of pottery vessels from the Byzantine period and fragments of ceramic pipe were discovered inside the channel. This channel presumably conveyed water from a source near the excavation area to a water reservoir that was also close-by the excavation area. 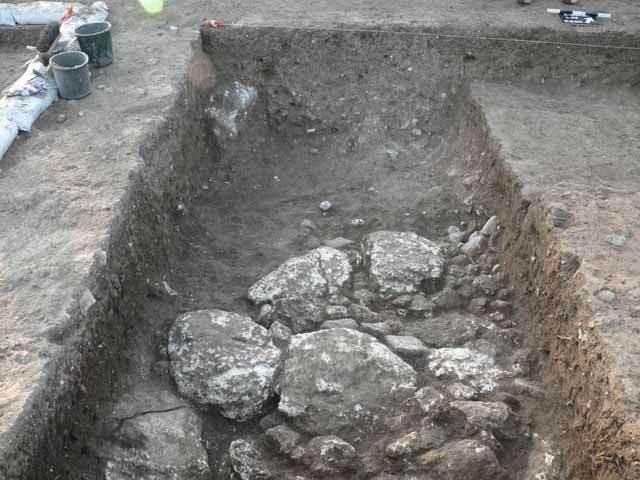 A cistern was discerned near the excavation area. It seems that the complex from the Byzantine period was part of the industrial region of Horbat Biz‘a, remains of which had been discovered in the previously conducted excavation at the site. Stratum II (Umayyad period; seventh–eighth centuries CE). 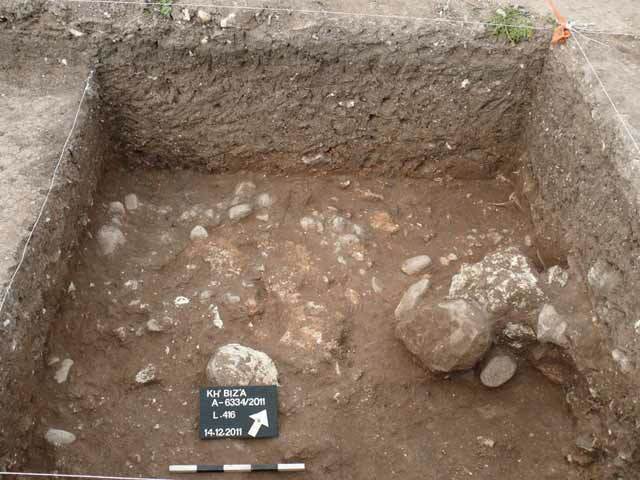 Remains of a floor that consisted of partially dressed limestone and a fill consisting of small stones were exposed in Square D7 (L433; Fig. 4). Remains of another floor that was built of small limestone were exposed in Square D8 (L436; Fig. 5). The two floors were founded on the bedrock that was leveled. Ceramic finds from the Umayyad period, including cooking pots (Fig. 6:1, 2) and baggy-shaped jars (Fig. 6:3–5) were discovered beneath the two floors. Stratum I (Abbasid period; ninth–tenth centuries CE). Remains of a wall (W10; exposed length 3.5 m, width 0.7 m; Fig. 7) were exposed in Square D10; it was built of an outer face of large partly dressed stones with soil fill and small stones between them and an inner face of small stones with soil fill between them. The wall was preserved a single course high and continued beyond the limits of the excavation area. Fragments of pottery vessels dating to the Abbasid period were discovered between the stones in the wall, including bowls (Fig. 6:6, 7), the second of which is glazed green on the inside, and baggy-shaped jars (Fig. 6:8, 9). 3. Hewn water channel, looking southeast. 4. Floor 433, looking south. 5. Floor 436, looking north. 7. Wall 10, looking east.